What Is Up With Cards Against Humanity’s Weird Snack, Prongles? OK, Cards Against Humanity. What gives? We think maybe now you’re making Snack Foods Against Humanity with your latest offering: Prongles. No, really. Snack aficionados are losing their minds online, asking WTF? 1. There’s an official Prongles website with the words, “[F]rom the company formerly known as Cards Against Humanity.” We reviewed the website with a mix of amusement and terrible, unspeakable dread. 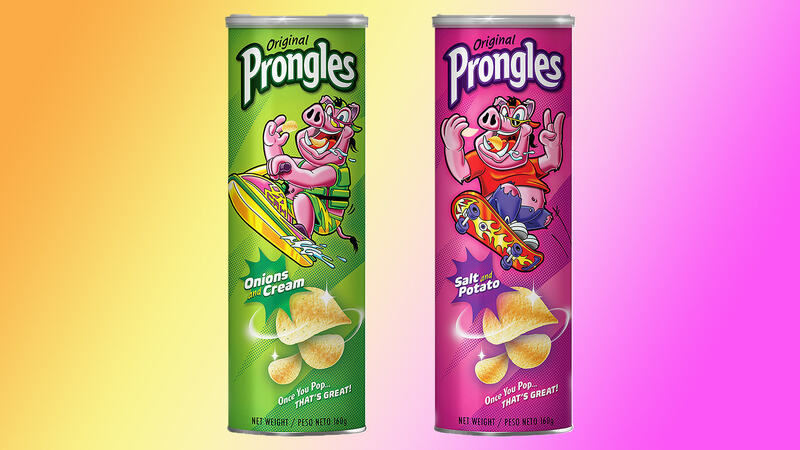 The site is rocking a brightly colored, vaguely sinister early ’90s vibe and is peppered with cheerful children and images of the terrifying pink Prongles mascot, Brayden the Hog (we can’t make this stuff up). Brayden’s best friend is listed as Justin Bieber. Bieber has yet to confirm the relationship. 2. There’s also an official Prongles Twitter account, where “options” for the official Prongles motto were trotted out in a poll. Um, we see what you did there, Cards Against Humanity — sorry, people formerly known as Cards Against Humanity. Not surprisingly, the motto that “won” was the bizarre — and inexplicably hilarious— “Once you pop, that’s great!” Yes. We’re laughing in a kind of nervous tittering way, but we don’t know why we’re laughing. We’re pretty sure the world is ending and we’re all going to hell in a Prongles tube. But we’re paranoid like that. 3. Prongles are sold at Target… in the toys and sporting goods aisle. Mmmmm’kay. Not sketchy at all. 4. They’re also on eBay. Righty-O. We found a set of two cans listed as “RARE” and costing a cool $21.99 (plus $6.95 shipping). We think you know what to get your mother-in-law this Christmas. She was tired of socks anyway. 5. They come in two flavors right now: salt and potato and onions and cream. Yup. You read that right. “Cream,” not “sour cream.” Makes you feel a little shaky, a little unsettled, right? But you can’t say why. It’s all very disturbing. 6. They’re made in Malaysia according to the website. But the website also says the next Prongles flavor — voted on by America — is set to be “whole fish.” We cannot. Even our cannots cannot. So we don’t really know what’s going on here. It feels like some kind of Upside Down snack world, and we’re thinking we’d better get out fast before the snacks eat us instead of the other way around.